OhGizmo Review – WaterField Designs SleeveCase | OhGizmo! A few years ago I was in the market for a new messenger bag and I knew I wanted something that would last me for a while. Since I also knew I wouldn’t find what I was looking for around where I live I started an epic online hunt to see what was available and what would suit my needs. I ended up stumbling across the WaterField Designs website after reading a couple of reviews and like a lot of people the first thing that caught my eye about their bags was the use of an actual aluminum aircraft seat buckle to hold the front flap closed. I thought it was a really unique design element so I bought one of their bags and have been using it almost daily for a few years now. 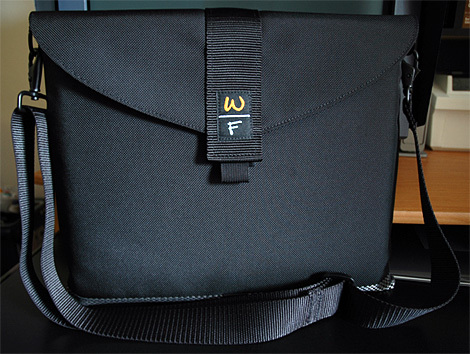 Well WaterField Designs is also known for their great laptop bags (and a wide assortment of other cases and bags for your electronic gear) and today I’ll be reviewing their laptop SleeveCase. The quick review is that the SleeveCase is a lightweight, streamlined solution for carrying your laptop that will keep it more than well-protected from loads of abuse. It’s available in a large variety of sizes which ensures a safe, snug fit for your laptop without adding a lot of extra weight and bulk to the whole thing. The SleeveCase is also quite versatile and can be used as a standalone laptop bag, in conjunction with one of the larger WaterField bags, or with any other bag of your choosing. If you want more than ample protection for your hardware while avoiding something that’s large and cumbersome then I highly recommend taking a look at the SleeveCase. Before I begin though, here’s a bit more backstory on my dealings with WaterField Designs in the past. What first impressed me with the company and won over my loyalty from the start was the outstanding customer service I experienced when I originally purchased my Cargo Bag a few years ago. Since at the time I was trying to find the perfect bag for my needs one of the issues I had to deal with was being a bit on the tall side. 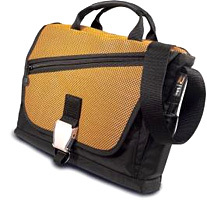 Unfortunately a lot of messenger-style bags I tried had shoulder straps that were far too short for my liking. After a quick email to the company inquiring about the length of the straps on their bags not only did they respond to my questions immediately but they also offered to make me a bag with a custom-length strap if their standard size wasn’t to my liking. So I was really excited when I got the chance to review one of WaterField Designs other products, the laptop SleeveCase. 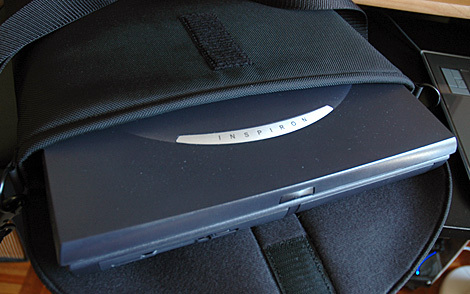 As the story goes the company’s founder and chief designer Gary Waterfield was originally contacted by the director of the MIT Media Lab since the facility was trying to find a laptop bag to meet their specific needs of being lightweight, convenient to use and most importantly highly protective. As a result of this request the SleeveCase was created and is now available to everyone. Besides the great customer service, WaterField Designs is also well-known for the high level of quality they put into their bags and cases. It’s been well over a couple of years using my Cargo Bag nearly every day and the thing still looks like it’s brand new. (Besides a few dings and dents on the buckle.) I have no doubt this case will last just as long. The SleeveCase is made from 6mm high-grade neoprene since the company feels it’s quite a bit more dense and has better shock-absorbing qualities than regular foam. I would have to agree since the sleeve has that tough rubbery feel of neoprene which gives the impression of being extremely resilient. This is then wrapped in a ballistic nylon shell and while it’s probably not going to stop a bullet it definitely makes for a tough outer layer on the sleeve. I opted for a version of the SleeveCase with a large triangular flap that securely covers the opening on top and besides keeping the laptop in, it also helps keep everything else out. (Rain for example.) 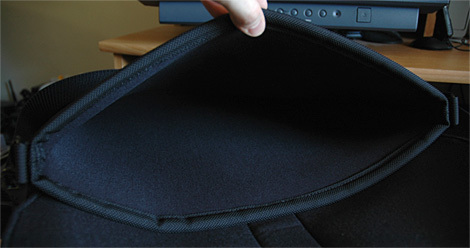 The flap is secured by a 5-inch piece of velcro that sits vertically oriented in the middle of the flap. I tend to prefer a bit more velcro when it comes to sealing things up but that being said I don’t think there’s any risk of the flap accidentally popping open once it’s been closed. If you plan to exclusively carry the SleeveCase inside another bag (and not on its own) I would recommend not adding the flap option since it does add a small amount of extra bulk and thickness to the sleeve, but not much. 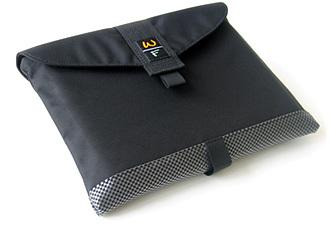 The flapless version of the SleeveCase instead uses a 2-inch thick nylon strap that velcros into place across the opening and will prevent the laptop from sliding out of the sleeve while it’s in your bag. 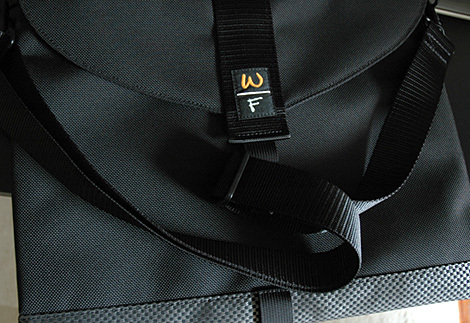 On the front of the flap you’ll find the WaterField Designs’ logo which is a simple W|F image. For those who aren’t fans of logos or images appearing on their bags this might be a concern but rest assured it really doesn’t stand out at all nor does it take away from the overall look of the sleeve. If it is a problem just tell people your name is William Faulkner or something and you had your initials added afterwards. On either side of the SleeveCase you’ll find another optional accessory which is a pair of metal D-rings. Again if you plan to exclusively carry this case in a larger bag you won’t need them but if you ever think you’ll need to carry it seperately you’re going to want to add these. I definitely like the fact that the D-rings are made of metal as I’ve seen quite a few other bags with plastic loops that have simply broken which almost makes the bag unusable. Having these made of metal means they’re going to last for a long time. Other manufacturers please take note: Metal = Reliable, Plastic = Ticking time bomb. The D-ring option also comes with one of two different shoulder straps. 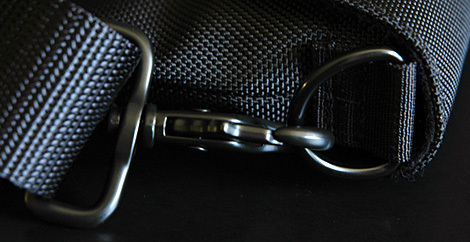 The simple shoulder strap shown here is a basic nylon strap about an inch and a half wide that is fully adjustable. And in keeping with the level of quality the clips on this strap that attach to the D-rings are also made of metal meaning they’re probably not going to break anytime soon either. 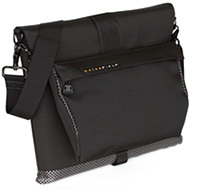 The other option (not pictured) is what WaterField calls the Suspension Shoulder Strap which as the name implies features a center suspension to make the bag feel a bit lighter and also has a sharkskin neoprene finish on the underside to stop the strap from sliding off your shoulder. The back of the SleeveCase has a single large pocket that’s basically the same size as the case itself. When you’re using the SleeveCase by itself this pocket is useful for stowing cables, power adapters and any other laptop accessories you feel the need to haul around. However you’ll notice that there’s really no way to seal or close this pocket so anything stowed in here is at risk of possibly falling out and if you’re carrying it outside will be exposed to the elements. If you do intend to carry the SleeveCase by itself and the open back pocket is an issue you’ll probably want to add the ‘Piggyback’ option to your case. It’s basically another external pocket that attaches to the SleeveCase via the metal D-rings that the shoulder strap uses. Besides adding more storage space the ‘Piggyback’ can also be zipped closed and has an extra little flap to help keep what’s inside protected from the elements. Around the bottom of the SleeveCase runs a one inch grey and black checker pattern (which they refer to as Lead Indium I believe) which actually looks really nice and is kind of a trademark design of the WaterField products. While the larger cargo and other bags available on the Waterfield Designs website can be customized with a wide-range of Indium colors and materials it seems the SleeveCase is only available in this grey and black finish. While some might really want the SleeveCase to match their other WaterField products it’s not a big issue for me. You’ll also find a nylon loop on the bottom of the bag which is used to help pull the laptop out of the sleeve, or pull the sleeve off the laptop, whichever way works best for you. And that’s pretty much all you’ll find inside the SleeveCase, no extra pockets or additional compartments that might add unncessary bulk to it. A simple design for sure but one that works very well. Don’t worry if you can’t find your exact make and model listed on the website either. My Dell is a few years old and I couldn’t find it on the Waterfield Designs’ site but after a quick email I was informed that they did have its dimensions on file but it wasn’t posted in an attempt to keep that public list from becoming enormous. So if you’re not sure the SleeveCase will fit your laptop I highly recommend contacting the company first. Odds are you’ll be in luck. Like I’ve mentioned a few times already the SleeveCase without any of the added accessories is designed to let you safely carry your laptop inside another bag without it getting scratched, dented or damaged by everything else you’re carrying. 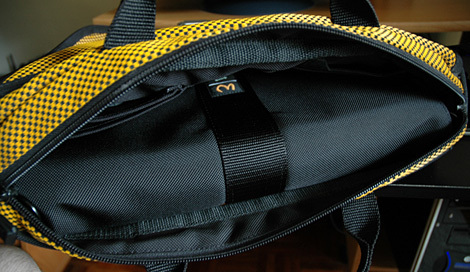 In the above shot you can see the sleeve (with my laptop inside) easily fitting into my WaterField Cargo bag. And because the SleeveCase is so thin odds are whatever bag you use it with you’ll still have plenty of extra space for other gadgets and gear. So I’ve probably said far more than needs to be said about a laptop sleeve but I think WaterField Designs is one of those companies that has managed to grow a loyal following and fanbase simply by making a great product and then going out of their way to make sure their customers are 100% satisfied. 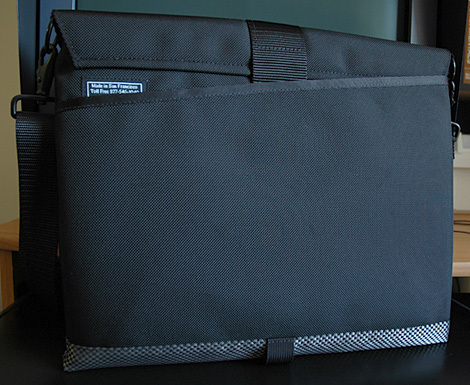 To me the SleeveCase is the perfect laptop sleeve and besides recommending it to friends I know that everytime I upgrade my system I’ll also be upgrading my SleeveCase as necessary. My pictures can’t really convey the level of quality and craftsmanship that are put into these things but if you think your portable computing investment deserves the best in protection you really need to look no further than the SleeveCase. + High-quality construction throughout. Every seam and stitch is perfect. + Clean, streamlined design does what it needs to, protects your laptop with minimal added bulk. + Base version reasonably priced. – Some may feel that with all the extra options added the SleeveCase is on the expensive side. – Minimal storage space for accessories like mice and power adapters (which can sometimes be necessary) without adding the ‘Piggyback’ option. – Only available in essentially a black and grey color scheme. WaterField Designs SleeveCase – $38-42 depending on the size you require. If you have any further questions or concerns about the SleeveCase you’d like answered please feel free to leave them in the comments section and I will try to respond to them as best I can. Informative review. Have looked online at practically every bag/sleeve/case and just about to settle on the sleevecase 23-19, with flap, suspension strap, piggyback. I have one of these and it’s AWESOME. Unbelievable quality and the company has amazing customer service. I bought the Waterfield sleeve and their gearpouch (small zipped bag for cables) about a year ago and both items have performed beyond my expectations. I’m now going to order a digital camera case and a few other odds and ends. The company has fantastic and very personalized customer service. I also experienced overnite shipping on my original order. I heartedly recommend Waterfield.